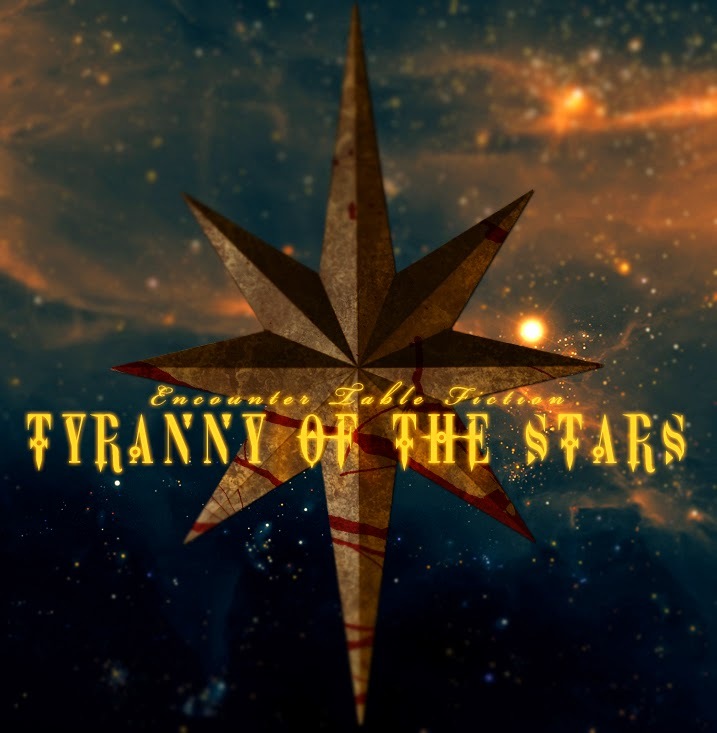 Given the positive response from yesterday's introduction to the Encounter Table's new fiction serial, I've decided to share a second installment from Tyranny of the Stars today, which also includes a Pathfinder game mechanic pulled directly from the story. Let us know what you think of the Encounter Table's fiction in the comments below! The Encounter Table is also looking for feedback on its Pop Creature articles. Is there a specific creature from popular media (television, books, video games, etc.) that we haven't covered and you'd like to see? Let us know in the comments! The Stormfront is one of only a handful of airships in use over the skies of Alkenstar and its neighboring settlements. The vessel is an engineering marvel of the modern world, constructed from the hull of a sailing ship held aloft on tethers of rope and corded metal affixed to an alchemically treated air-bladder. At its rear, enormous metal propellers spin so fast they are but a buzzing blur. Fins of wood and leather strung with tendons of rope jut from the starbord and port sides, pitching and tilting to steer the aerial behemoth. Travelers venturing south into the Mana Wastes aboard vessels like this tend to spend most of their time above-decks, marveling at the miracle of technologically-assisted flight. The cost of maintaining these airships makes most travel restricted to wealthy elites, though from time to time well-paid mercenaries or troops of explorers backed by the wealth of nobility charter passage to avoid traveling the hostile, and often times unpredictable, wasteland below. "How does it all work?" Is a question most of the Stormfront's crew are used to hearing. First-time travellers feel compelled to ask it at least once, and Aribessa Montclaire looks the part with her wide-eyed stare and eager smile. The deckhand she poses the question to ambles over with a spool of rope over one shoulder. Aribessa is quick to gesture down over the side of the ship to clarify her question, and the deckhand peers over the rail, spying one of the waggling metal and leather steering fins. "Pulleys," he explains, pointing behind the young woman to a series of ropes coming up through an opening in the midship, twisting over rows of pulleys and extending down at an angled line towards the aftcastle. Aribessa's eyes follow the line of the ropes to their terminus, rising up on booted toes as if the extra inch or two of height would allow her to see exactly where they end up. Her stare flicked side-long to the deckhand wordlessly begs for the answer. Exhaling a laugh mixed with a sigh, the deckhand slides the coil of rope off of his shoulder and onto the deck with a thud, then extends a gloved hand. "Patris," he introduces, and at first Aribessa only stares down at the hand as if uncertain exactly what to do with it. One awkward moment later his hand is gripped with a firm, if tentative, shake. "Aribessa," comes awkwardly after the handshake. Though the raise of her brows implies that she's still waiting for her answer, and that it's a pressing matter—from her perspective. Grimacing awkwardly, Patris nods towards the aftcastle and turns to walk that way. Aribessa catches up with a few hustling steps shortly thereafter. "The pulleys are all connected to the levers at the helm," Patris explains, "where the Captain—"
"Won't you get in trouble?" Aribessa interjects abruptly. Patris pauses, looks askance to the girl and quirks his head to the side. "For giving you a tour?" "For abandoning your, uh..." Aribessa looks over her shoulder with a wrinkle of her nose, "spool?" Patris snorts out a laugh and waves one hand dismissively at her, seemingly fine with the distraction. "Like I was saying, the Captain commands the ship and gives orders to the pilot who handles all of the flight controls from the helm up on the aftcastle. But that's not really how it works," Patris notes with a wave of one hand up to the air bladder. "That's the most important piece. It's an absurd amount of treated fabrics stretched over a darkwood frame and filled with an alchemical gas that keeps the whole vessel aloft." As Patris speaks, Aribessa's gaze wanders up to the airbladder and a gathering of birds perched on the taut ropes stretched between pulleys. Her attention shifts between bird and contraption equally, briefly making note of the position of a single sparrow among the gulls. "Below decks there's a coal furnace that creates steam power," Patris continues, "that drives the propellers in the rear of the ship and allows us to move forward, and then comes the fins that help us steer." "How old are you?" Aribessa asks suddenly; not the question Patris has been expecting, given her expression. "Ah—" his brows raise slowly, "twenty? Twenty." Patris is still short for a man of twenty, she surmises. The question about Patris' age is less pressing than the mark she's spotted on the right side of his neck, part of a tattoo; a two-headed dragon. The question is more of a distraction than anything. "Likewise," Aribessa notes off-handedly about her own age, even if Patris hadn't inquired in return. She runs a hand through her windblown hair, turning about face and regarding the ship once more. "So, why go through all of this trouble when you could've done most of it with magic? Presumably cheaper, at that." Patris is used to inquisitive passengers, but usually they have a certain level-headedness about them. He's come to see Aribessa more as the result of a tornado passing through a library; lots of words, but not entirely in any order that makes sense. "You're joking, right?" Patris blurts out in bewilderment at her ignorance. Aribessa isn't joking, though that's not really the problem. "I mean, you're—we're headed into—"
"The Mana Wastes!" She exclaims, more out of absent-minded realization than excitement. "Unreliable magic, right—right." Rubbing the heel of her palm at her forehead, Aribessa mumbles a chastisement to herself, then flicks a look over to Patris. "Long day?" He asks with a helpless shrug. Aribessa mirrors his expression and exhales a tired sigh to go with it. "I've had a lot on my mind since we left Nex," is noted with a fleeting grin, "but we're only a few hours out from Alkenstar, so I think once we land I'll be a little less jumbled. Less mental juggling going on then." Still not entirely sure of whether he'd sufficiently answered her question, Patris reaches up to scrub one hand at the back of his head. "So..." he barely manages to get the words out. "Thank you... Patris, was it?" Aribessa interjects as she walks back a few paces, still facing Patris, with one hand clinging to the strap of her tanned leather satchel. He opens his mouth to respond, but she just talks over his attempt. "I'm sorry, too." It's only then that Patris notices Aribessa isn't looking at him, but rather over his shoulder. One brow raised and mouth still parted in that attempt to talk, Patris turns to look back and locks eyes with the stern glare of the ship's captain, standing by the discarded and now uncoiled spool of rope Patris was carrying earlier. When he looks back to Aribessa, she's gone. The door to the below decks is open just enough for a young woman to hastily flee through, however. By the time Aribessa is out of sight, the raised voice of the Captain is just a muffled roar through thick wood. She is sorry, but Patris had mentioned a steam engine, and she was going to need to see that in closer detail before they reached port. Your affable personality makes it difficult for opponents to gauge your true intentions. Benefit: You may substitute a Diplomacy check for a Bluff check made to decieve someone or to create a diversion to use Stealth while being observed.